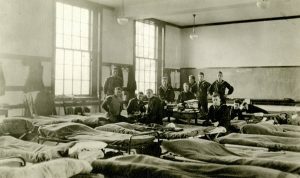 Student Army Training Corps cadets in their Hopkins barracks, 1918. From the Ferdinand Hamburger University Archives. While many of us are familiar with photos of college students burning draft cards and protesting during the Vietnam War, far fewer people are aware of the impact that World War I had on the students of its time. In 1917, under President Woodrow Wilson, the Selective Service Act was passed, mandating that all men between the ages of 21 and 30 must register for military service. As a result, over 10 million American men registered for the United States military. Not all men who registered for the draft were selected for military service, though and the overwhelming majority of newly drafted soldiers had no military experience or training. In 1918, in an effort to expedite the influx of trained soldiers into the military, the Student Army Training Corps was created. A voluntary program, SATC allowed willing students to simultaneously study at a college or university and undertake military training, with the intention of joining the military upon graduation. Hundreds of American universities took part in the program, including Johns Hopkins University. Hopkins pledged to accept 708 SATC students on the Homewood campus and in the School of Medicine in order to support the wartime effort. On the Homewood campus, the SATC students would live, train and study on campus and in their living quarters in Gilman, Maryland and Latrobe Halls. In October 1918, the students arrived on campus. While Johns Hopkins was committed to the success of the program, the SATC was short lived. The Student Army Training Corps was disbanded by December 1918 in response to the collapse of the Central Powers and the resultant end of the war. Though the SATC is long gone, Johns Hopkins is still active in helping students who want to pursue both academics and a military career with an robust ROTC program celebrating its 100th anniversary this year. The Hopkins and the Great War exhibit (on display until January 2017) explores the impact of World War I on the Hopkins community. To learn more about World War I and the Student Army Training Corps, visit the Hopkins and the Great War exhibit on display in the Milton S. Eisenhower Library on Homewood campus, or explore the comprehensive digital exhibit.